What a great day to start the day! We went to Ik-Kil, a cenote near our hotel. Not knowing what the place would look like, our jaws dropped like never before! We were not the first to get there at 8am but there were two ladies in bikini already starting to swim there before we did so we let them tried the water. I then jumped into it without knowing how deep it was until the lifeguard told it was about 50m deep. There were small black fish swimming with us but they had no eye since they came from an environment deep inside the earth where lights nearly existed. The cenote itself has water surface about 20-25m below the ground with a round opening created millions ago measuring about 40m in diameter! As good parents we managed to get life vests so that we could hug Noe safely while swimming. 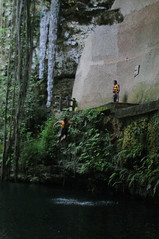 Yodhi and Indi managed to do some stunts jumping from 6m cliff while posing for the video camera and yelling Chichen Itza! 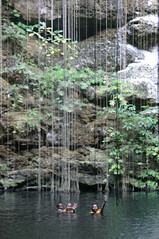 It was indeed a refreshing swim in a cenote that seemed to only belonged to us. 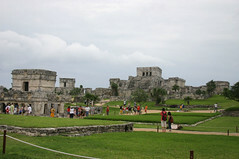 At 10:30am we checked-out of the hotel and started to drive along the country road to Tulum via Valladolid and Coba. Indi overestimated the travel time and my guess was right, it took us only 2.5 hours instead of 3. Arriving at Tulum at 1pm we were hungry but too excited to see the ruins. 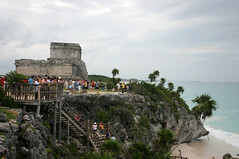 Unlike the well-organized Chichen Itza or Teotihuacan, the staff at Tulum seemed too lazy to enforce the rules. The public amenities were not well kept. We guessed hurricane Wilma may have damaged some of it but I think it was mostly due to mismanagement of the park itself. I was not too happy to see many people ignoring the roped boundaries. Some even climbed up fragile a structure. Below the cliff, hundreds of people were swimming in the turquoise waters. Indi said heâ€™d never seen anything like the turquoise sea (despite the thick dark cloud that hang over us). 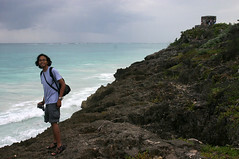 Perhaps it was because the area is surrounded by miles of coral reef at about 500m from the beach. 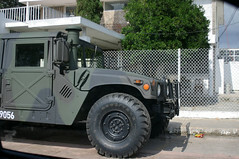 Soon after Tulum we drove to Playa del Carmen where we have booked a room at Hotel Cielo. At first we thought the city looked like any American town with major shopping centres along 4 lane wide highways but we changed our opinion when we entered the old part of town. Our hotel is located inside the hotspot where everything is happening. Streets are closed to create pedestrian friendly environment that stretches tens of blocks just within 5 minute walk from the beach. 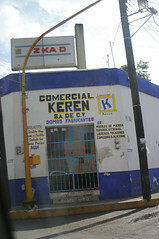 In comparison to Zona Hotelera of Cancun, this is far much more interesting and we thought we should have stayed here first instead of Cancun. 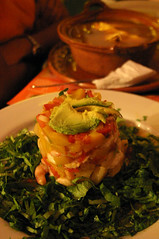 Based on the recommendation of Lonely Planet, we had dinner at the Oasis where we ordered Caviche, some kind of appetizer made from shrimp and fruits (Ceviche). 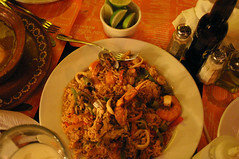 A paella full of savory seafood was served on a big plate for us to share. 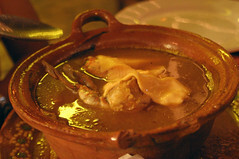 A seafood soup that resembles clear gumbo was what we had together with a drink made from rice (Agua Horchata). It was a great dining experience for a reasonable cost. Across the restaurant there is a tortilla vendor that sells from a classy VW van, and Noe really liked the van. Yodhi was busy shopping around for diving trip deals from various shops in preparation for tomorrow's fascinating day at the Playa. As for Noe, we will follow his schedule and try to lure him into turquoise water. We will do so after sending our dirty clothes to lavanderia. This is a great place to end our Mexican trip before going to Cuba since the cafe across the street from our hotel plays a great salsa with powerful congas and brass section. We will sleep through it. Same thing happened to us. We spent 3 days in Cancun at an all-inclusive and decided on a whim to see Playa. We were all so glad we did ... I'll never go back to Cancun again. Been to Playa once more based on the good experiences we had the first time. We had no clue where to go the first time and ended up at Blue Parrot (kind of sucked). The second time we picked the Hotel Deseo based on a recommendation at SeePlaya. You have to see it to believe it ... very minimalistic and loungey. saw you stayed in Hotel Cielo! I'm looking for comments on this hotel but not able to find on the web. Is the once on the corner between 5th av and 4th st. ? If this is the one where you stayed could you please let me know how it is ?